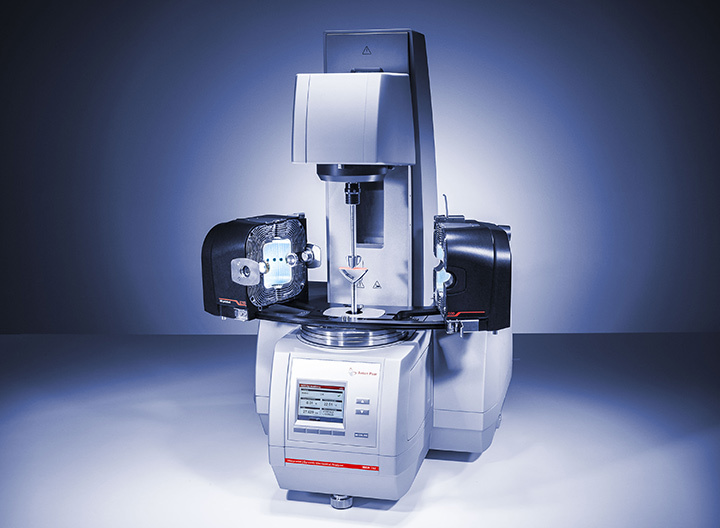 MCR 702 MultiDrive is the most versatile rheometer suitable to work in all standard test modes known from a rheometer and ready to be equipped with an additional lower drive unit. This modular concept enables MCR 702 MultiDrive to perform rheological tests with two torque transducers and drive units at once – flexible and precise enough to deliver the results you need. 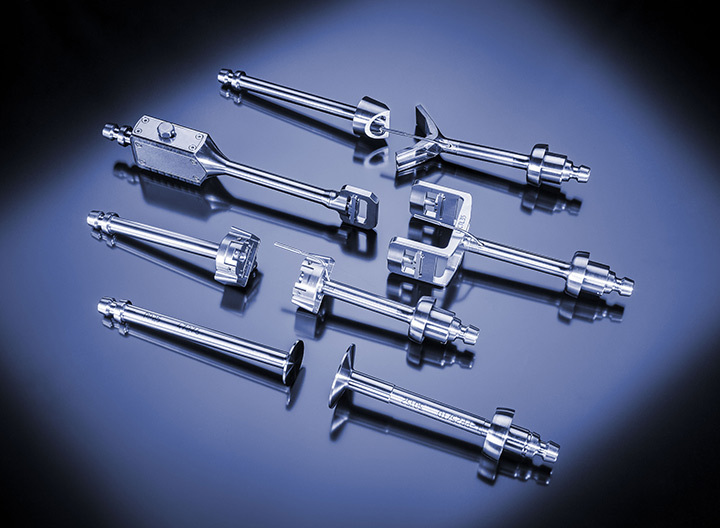 There are no limitations regarding the used test modes, suitable measuring systems, accessories, and temperature devices and also regarding measurement precision. In short, this is the system of choice to cover all possible rheological applications. The combination of two air-bearing-supported rotational drive units enables you to perform rheological measurements in Combined Motor Transducer (CMT) mode and in Separate Motor Transducer (SMT) mode. Using a single air-bearing-supported EC motor unit in the CMT mode, you can make the most of the motor’s TruStrain™ capability and perform ‘classic’ stress-controlled tests. 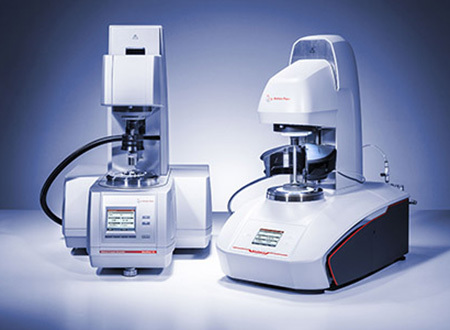 In the SMT mode one motor is operated solely as a torque transducer, while the other motor is used as a drive unit only, to get the purest rheological results even in the transient regime of the measurement. While other rheometers are limited to one working mode, MCR 702 MultiDrive gives you the choice of all of them. In the counter-movement mode, MCR 702 MultiDrive employs both air-bearing-supported EC motors as drive units as well as torque transducers. Both motors are easily set to move in opposite directions, which can be used e.g. to create a fixed stagnation plane in a sample for advanced structure analysis of materials under shear using the microscope. This mode is also used with a universal extensional fixture for extensional tests down to minimal measured torques. 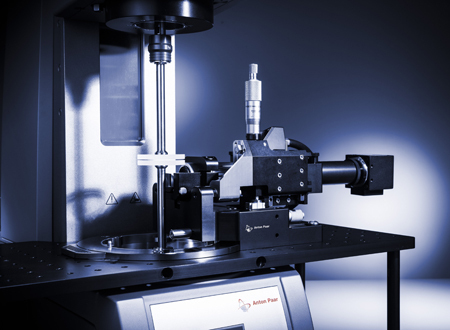 Regarding speed, the counter-movement mode simply ‘doubles the score’ – up to a maximum speed difference of 6000 rpm which broadens the shear rate range for high shear applications. Instead of a lower rotational drive, an additional lower linear drive can be used to perform DMA in bending or compression mode using measuring systems such as three-point-bending, cantilever, or parallel plate. Furthermore, in combination with geometries for films, fibers, and rectangular samples the linear drive can be used to perform DMA in tension whereas the upper rotational drive is used for DMA in torsion – both within a single test definition. Additionally, the linear drive is capable of performing thermomechanical analysis, creep and recovery or relaxation tests. Find more information about the DMA capabilities here. 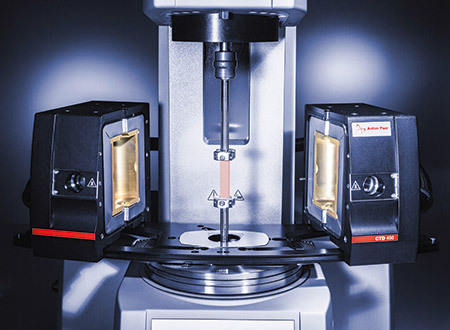 Control the greatest influence of all – temperature – by using high-precision temperature control units in combination with Anton Paar’s innovative optoelectronic technology. The technology enables contact-free data transmission based on light emission and the photovoltaic effect to detect the true sample temperature. This enables temperature determination without affecting torque sensitivity in Separate Motor Transducer (SMT) mode and also in counter-movement mode. 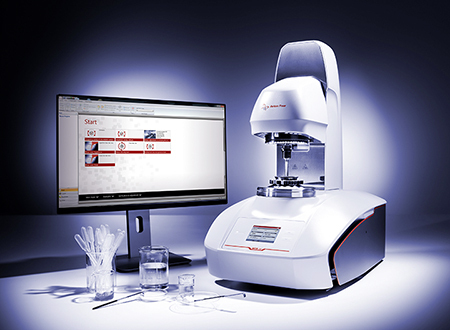 MCR 702 MultiDrive is ready to be equipped with any measuring system, temperature device, and/or application-specific accessory known from the Anton Paar MCR series in order to carry out standard and sophisticated rheological analyses of your sample. The patented Toolmaster™ feature automatically recognizes and configures all connected devices and measuring systems. Additionally, the QuickConnect function allows one-hand connection of the measuring systems. Both features ensure the highest flexibility and minimum work needed to adapt the configuration to your demands. The intuitive RheoCompass™ software helps you to find the predefined or customized test templates you need, customize tests and analysis definitions, and export your data and generate reports. The software offers a broad variety of predefined but individually adaptable analysis methods, e.g. time-temperature superposition, LAOS, transient methods, etc. Use the media explorer to display pictures or videos filmed by connected cameras such as the digital eye camera. As the software uses a Microsoft SQL 2012 database managing and retrieving data is as easy as generating it. 1) Depending on measuring point duration and sampling time practically any value is achieved. 2) Set frequencies below 10-4 rad/s are of no practical relevance due to the measuring point duration > 1 day. 3) Theoretical value (duration per cycle = 2 years).